Tripping Billies and Dancing Nancies: A DMB Fan Site! Welcome to Tripping Billies and Dancing Nancies: A Great DMB Fan Site! 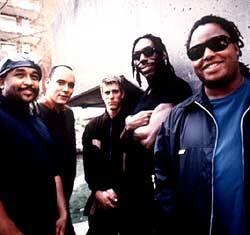 The Dave Matthews Band has been called such things as "The hottest band on the planet" and "Amazing, Stunning, Outstanding!" and with its infectious compilation of rock, jazz, hip-hop, blues, R&B and whatever else you can imagine, it's not hard to see why the Dave Matthews Band is seen as one of the best bands today! Its fanbase is huge, and growing everyday, and due to Daves enormously appealing riffs and songs, its no wonder why the Grammy Award® winning DMB was VH1's Artist of the Year, why the band sells albums as fast as they are put on the shelf, and why it takes no more than a few minutes to sell out tickets to their shows, even in huge stadiums! As you can see, I more than like the DMB, you could come close to saying that I'm almost obsessed. I just can't get enough of their music, and ever since I bought "Under The Table And Dreaming" (UTAD) 5 years ago, I've been hooked! I have every CD the band has put out, and even have doubles of many of them, just in case. I have posters, letters, concert tickets and pictures galore lining my bedroom walls, over 9 DMB bumperstickers on my car, and of course, I'm a loyal Warehouse Fan Club member! But enough about me, on to the good stuff, what you most likely came here for... 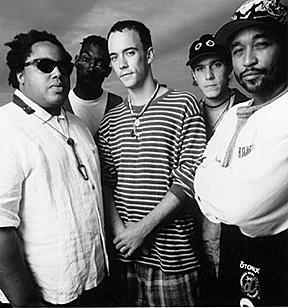 Either you have never heard of the amazing Dave Matthews Band, and you came here looking for a little more information on this great phenomenom, or you are a loyal fan just surfing the net for the best DMB site, you came to the right place. Please look around, see what there is to see. Browse my picture gallery, maybe the lyrics page, and then wander over to the news page to see whats new, and maybe over to the links page to check out other great DMB pages. But, whatever you do, just make sure that you have fun, and if you get a chance, sign the guest book, or mail me with comments or suggestions! Dave and the band are currently in the studio recording their 4th studio album which should be released late spring/early this summer. Theres no need to guess that it will be amazing, but reserve you're copy now, they're going to sell like crazy! Be sure to catch the movie "Where the Red Fern Grows" when it comes out this summer, as Dave is a lead character in the movie, and it should be interesting to see Dave put his acting skills to the test! Last updated on 1/28/00 at 4:13 p.m. This Page is Copyright Brad Schargorodski 2000®. 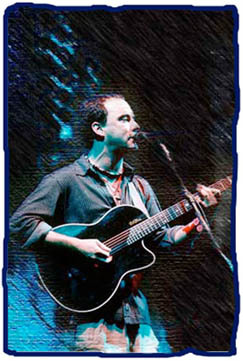 and the DMB photoshop for the use of graphics.